Samsung’s Foldable Phone Key Specifications Revealed - Playfuldroid! 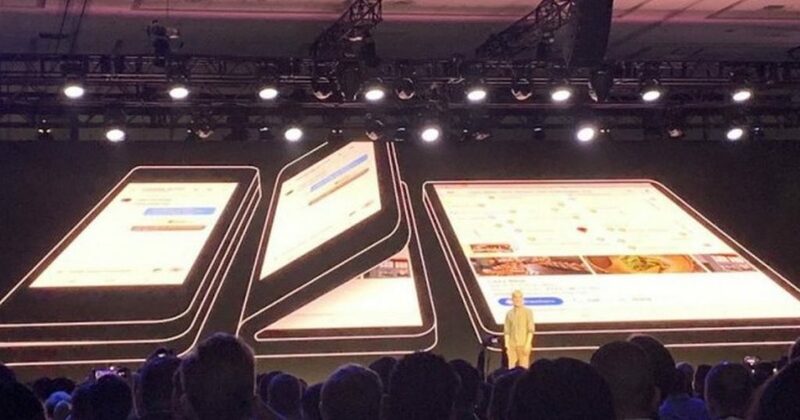 At San Francisco, U.S, Samsung announced the Infinity Flex Display for its first foldable phone through the Samsung Developer Conference (SDC) 2018. The company is yet to disclose the name and launch date of its upcoming foldable phone. The South Korean company has confirmed on the key specifications of the Infinity Flex Display. The Infinity Flex Display can be folded and opened vertically. Once opened, the device featuring it can appear like a tablet. According to Samsung, the outer screen of the phone is called cover display while the one present is called main display. The cover display measures 4.58 inches and it supports Full HD+ resolution of 840 x 1960 pixels. The aspect ratio offered by the outer display is 21:9 and it produces a screen density of 420 dpi. As far as main display is concerned, it measures 7.3 inches and produces a resolution of 1536 x 2152 pixels. It has an aspect ratio of 4.2:3 and pixel density of 420dpi. Samsung has also revealed that its first foldable smartphone will its new One UI that has a minimalistic design. Its designed to promote single-handed operation. The apps that are opened on the outer display can automatically change into a bigger version for the main display when the device is unfolded. Samsung has confirmed that the mass production of the Infinity Flex Display will begin soon.